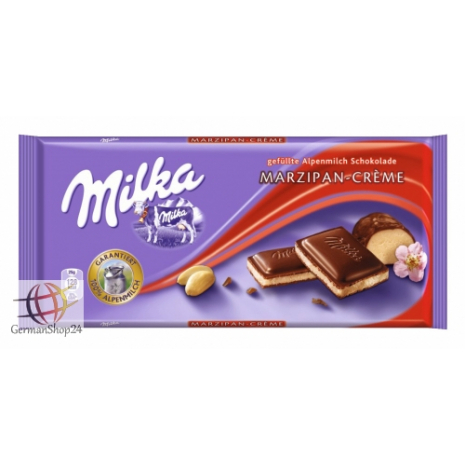 Milka Marzipan Cream consists of the signature smooth melting Alpine milk chocolate with a delicious marzipan cream filling. Sugar, cocoa mass, marzipan (15%) [sugar, ALMONDS, water, humectant (sorbitol syrup), glucose syrup, stabilizer (invertase)], cocoa butter, invert sugar syrup, vegetable fats (palm, shea), SKIMMED MILK POWDER, SWEET WHEY POWDER (from MILK), BUTTERFAT, glucose syrup, alcohol, emulsifiers (SOY LECITHIN, sunflower lecithin), HAZELNUTS, flavors. 23% cocoa mass in the cocoa cream. 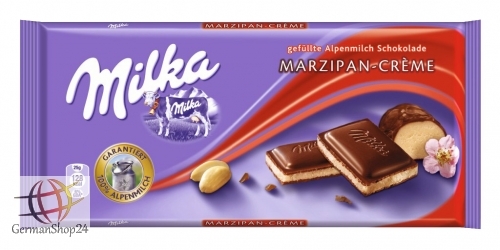 Zucker, Kakaomasse, Marzipan (15%) [Zucker, MANDELN, Wasser, Feuchthaltemittel (Sorbitsirup), Glukosesirup, Stabilisator (Invertase)], Kakaobutter, Invertzuckersirup, pflanzliches Fette (Palm, Shea), MAGERMILCHPULVER, SÜSSMOLKENPULVER (aus MILCH), BUTTERREINFETT, Glukosesirup, Alkohol, Emulgatoren (SOJALECITHIN, Sonnenblumenlecithin), HASELNÜSSE, Aromen. 23% Kakaomasse in der Kakaocrème.